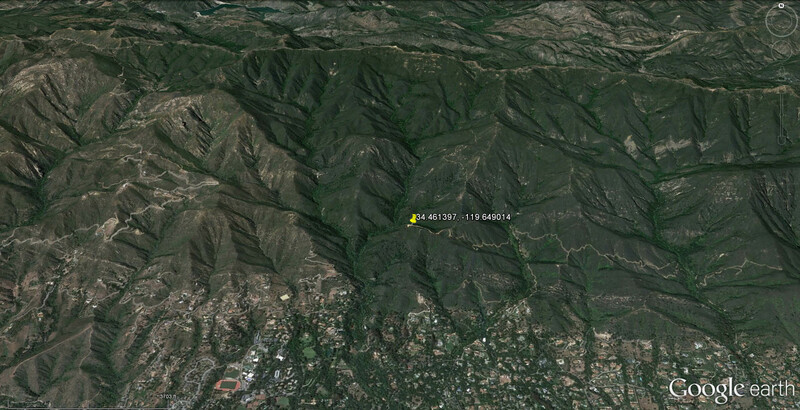 The Montecito Data Reporting Station is located at 1,619 feet in the foothills above Montecito. Located at elevation 1500 feet. Latitude 34.46, Longitude -119.643. Looking at the coordinates with Google Earth (image below), it appears that the MOSWest coordinates from the University of Utah are more accurate. MTC will experience more drainage wind from the north than other locations that are more protected. If you are concerned about potential north drainage wind, check the MTC observation. Note: when there is north drainage wind, the station seems to report very high wind speeds. Not sure these speeds are accurate. They tend to be higher than anything else around. They will typically indicate 40 when La Cumbre is only indicating 25. (to avoid excess clutter, I don't recommend saving place mark on exit from Google Earth).